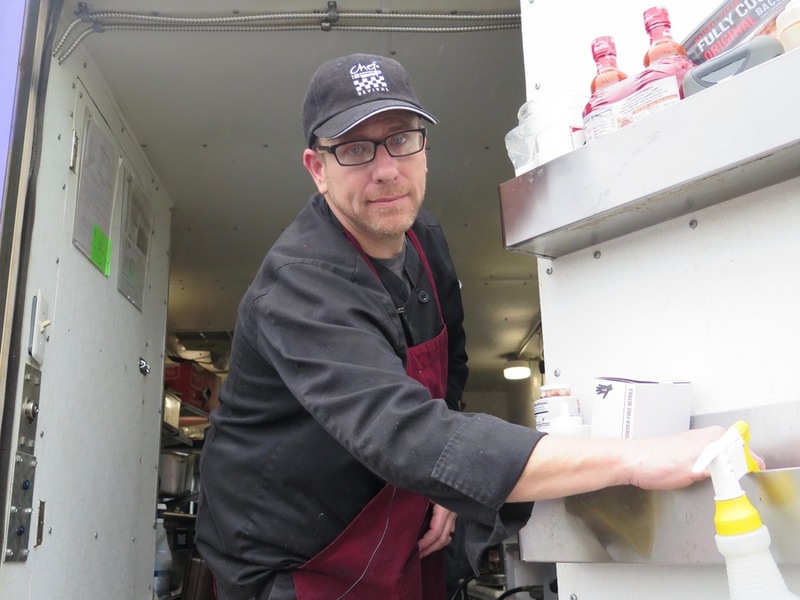 SHARONVILLE, Ohio -- Moments after blistering his hand on a hot, metal bowl and realizing he was out of burn spray, Chef James Akers was quick to admit that owning and operating a food truck can be a tough way to make a living. Then there are the health inspectors. Food trucks, with their tight quarters, tiny kitchens and limited staffs, must follow the same health codes that big, fancy restaurants do. Despite those challenges, food trucks fared well in WCPO’s annual examination of food-safety violations recorded by health inspectors across the Tri-State. This marks the fifth year WCPO has done the report but the first time we have looked at the results for food trucks specifically. Pretzelfuls received 14 violations from the Northern Kentucky Health Department in 2017, more than any other food truck operator in the 33,000 records WCPO examined. But that’s far lower than the businesses with the highest number of violations last year. In fact, 19 restaurants and food businesses received more than 50 violations each. Four of the region's top ten violators were grocery stores, which racked up four times the violations of food trucks on average in 2017. That much was clear when Akers allowed a WCPO camera inside his cramped space as he served the lunch crowd in the parking lot of Jacobs Engineering Group at 1880 Waycross Road. Akers is part of a growing local industry. Hamilton County licensed 287 mobile food units in 2017, up from 111 in 2013. Inspectors check these units for adequate refrigeration and hot-water sources, proper food-handling techniques and menus that are accurate and honestly presented. That’s a lot of rules for a cupboard-sized kitchen that barely fits more than two humans at once. Akers said his truck has been inspected far more frequently than the restaurants where he has worked. But that’s not always the case. 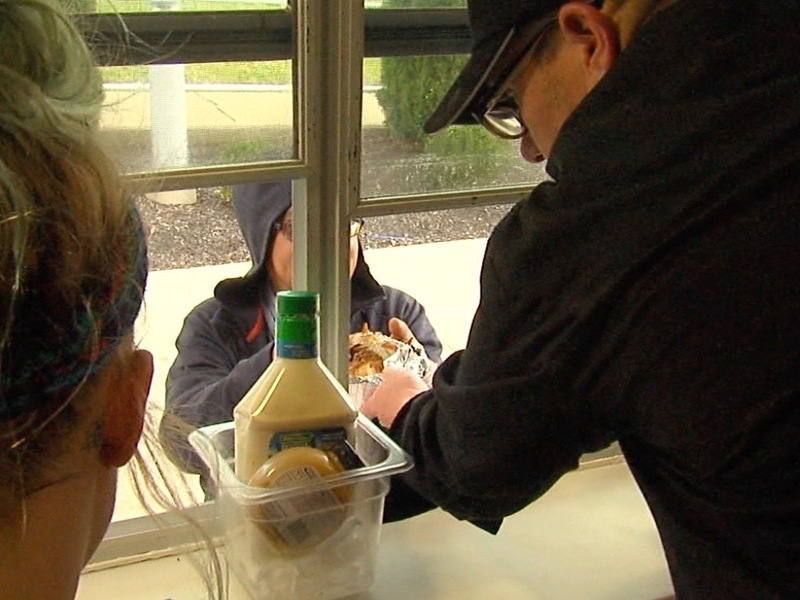 Ohio law only requires health departments to inspect food trucks once a year before they open for the season, said Greg Kesterman, Hamilton County Public Health’s assistant health commissioner. Inspectors can visit them while they’re out at events, too, but that doesn’t happen on a regular schedule, he said. And restaurants that have problems the first time an inspector visits tend to get inspected more often, which can boost their violation counts, Kesterman said. 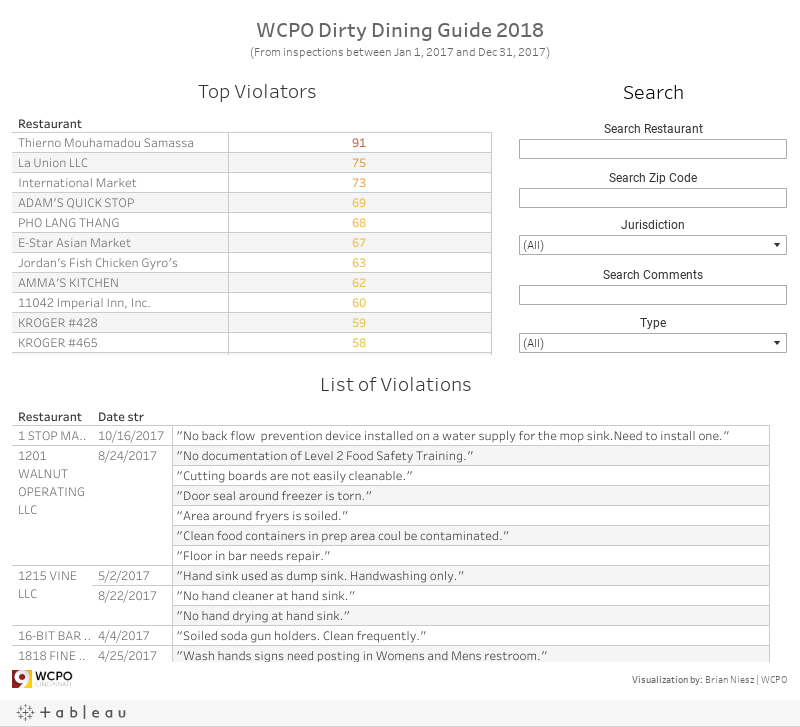 That’s what happened with some of the region’s top food-safety violators in 2017, including Thierno Mouhamadou Samassa, a restaurant that catered to West African immigrants in in Lockland. Hamilton County records show inspectors closed the restaurant in September due to a “repeat critical roach violation.” It re-opened after passing inspection with no violations Oct. 4, but neighbors said it closed again in November and hasn’t reopened since. The door was locked with no activity inside when WCPO visited the restaurant March 20. We’ve been unable to locate the restaurant’s owners. Frequent inspections also drove up the violation counts at four local grocery stores that ranked in the region’s top ten in total violations. All four received at least six visits by inspectors in 2017. International Market in Lockland saw 15 visits, including seven in the month of July alone. Hamilton County inspectors documented “rodent droppings in many areas of the store” on July 13, leading to frequent inspections and the store’s voluntary one-day closure on July 18. Hamilton County inspectors documented at least one violation in all but one of International Market’s last 18 visits dating back to December 2016, including food packages “accessed by rodents” in July and “roach activity around the water heater” two months ago. Ba is planning to move his store down the street to a building he purchased last February at the corner of South Wayne and West Wyoming avenues. He’s renovating the new space now and hopes to open the new store in the next several weeks. Another independent grocery store is bracing for a second straight year of intervention by Springdale health inspectors. Delicias Supermarket at 316 Northland Boulevard received 75 violations in 2017, more than 60 of them in four visits between Feb. 6 and March 13 of last year. The Hispanic grocery store owned by La Union LLC declined to comment, citing advice from its attorneys. Springdale Health Commissioner Matt Clayton said the store improved throughout 2017. But on April 3 inspectors documented 17 violations in the Northland Boulevard store. Six of the violations were critical in nature, including beef and chicken held at improper temperatures and gnats in the kitchen. Clayton said the department would develop a “risk control plan” for the store, aimed at bringing it back into compliance. It the plan is not followed, state law allows the Springdale Board of Health to suspend or revoke the store’s food-service license. 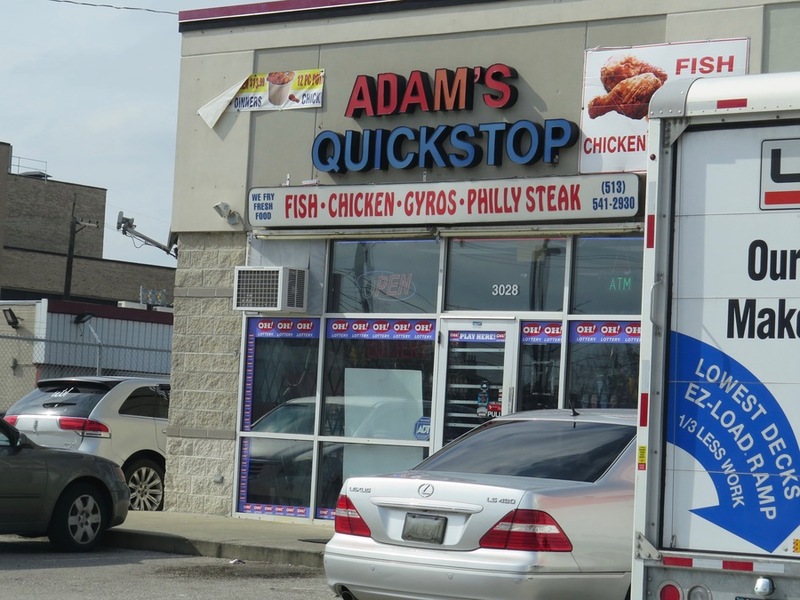 A Camp Washington convenience store called Adam’s Quick Stop on Colerain Avenue had 70 violations over a series of inspections in 2017, including several related to the temperature of gyro meat sold there. Manager Sue Itawi said the store has “fixed everything they’re talking about.” She said the problems with the health department started when the inspector directed her husband to throw away nearly $200 worth of meat, and he refused. The city’s online data portal doesn’t show records for any new inspections conducted at Adam’s Quick Stop this year. But Itawi noted that the business renewed its license a few weeks ago, which she assumes would not have been allowed if there were any lingering concerns. Supermarket giant Kroger Co. had two stores among the 10 food businesses with the highest number of violations. The Cincinnati Health Department cited its Spring Grove Village store on Kenard Avenue for improperly dated deli meat and plumbing problems that went unfixed for weeks among its 60 violations last year. The Kroger store on Kenard Avenue. 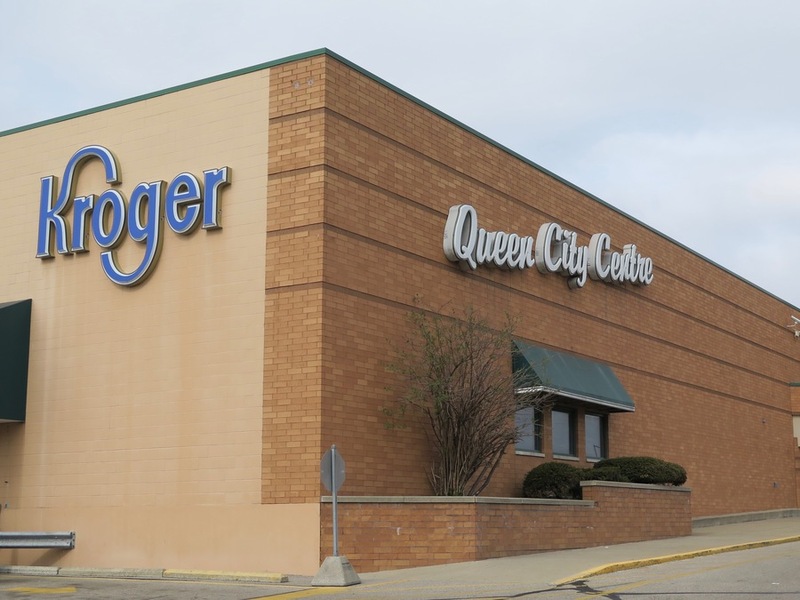 An inspector recorded 59 violations at the Oakley Kroger on Marburg Avenue in 2017, including a soiled iced tea nozzle in the customer self-serve area and an “unclean” floor in a walk-in freezer. WCPO’s analysis of 2017 inspection data shows the average local grocery store received 9.4 violations, compared to 1.9 violations for food trucks and 6.6 for all food-service locations. So, why would a grocery store have more violations? One answer is volume. The average McDonald’s restaurant is 4,000 square feet, which means you can fit 30 of them in a Kroger Marketplace store. Beyond that, a full-service grocery store has a broad range of food offerings, from fully cooked meals to deli meats, bakery, produce and dairy products. “These facilities are often open 24 hours a day and may serve a high number of guests compared to traditional food service operations or retail food establishments,” wrote Springdale’s Health Commissioner Matt Clayton. 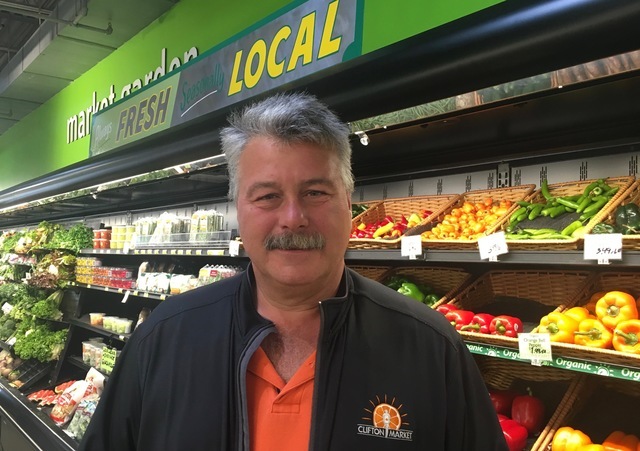 Clifton Market General Manager Keith Brock agrees that grocery stores are more complicated. "There's a lot to walk and talk and make sure that people understand," said Brock, whose store had 47 violations in 2017 but only one that hadn't been corrected in by its last inspection March 6. "You have your produce, your food service area, which is like a restaurant. You've got your meat department. And then if you have sushi you have a total different concept that has to be handled there. Not counting dairy. So, inside your realm you might have eight to 10 different aspects you have to watch out for." City inspectors cited Clifton Market last May for having a baby inside its sushi area and using a non-commercial rice cooker to prepare its products. Brock ultimately replaced his contractor with store employees so he knows its sushi is prepared correctly. "Everything I've asked them to do, they've done," said Jennifer Rouse, an environmental specialist with the city who regularly inspects Clifton Market. "We're working together. It's been a great partnership." Some business owners have seen their violation counts increase when they are focused on expansion and new locations. That’s what happened at the popular Pho Lang Thang in Over-the-Rhine, said Duy Nguyen, the restaurant’s operating partner. Nguyen said he got rid of a manager who wasn’t correcting the problems and got ServSafe training for more team leaders and anyone in a management role. Pho Lang Thang at Findlay Market. “I think we’ve got it under control at this point,” he said. The time of day that the inspector visits has had an impact too, he said. 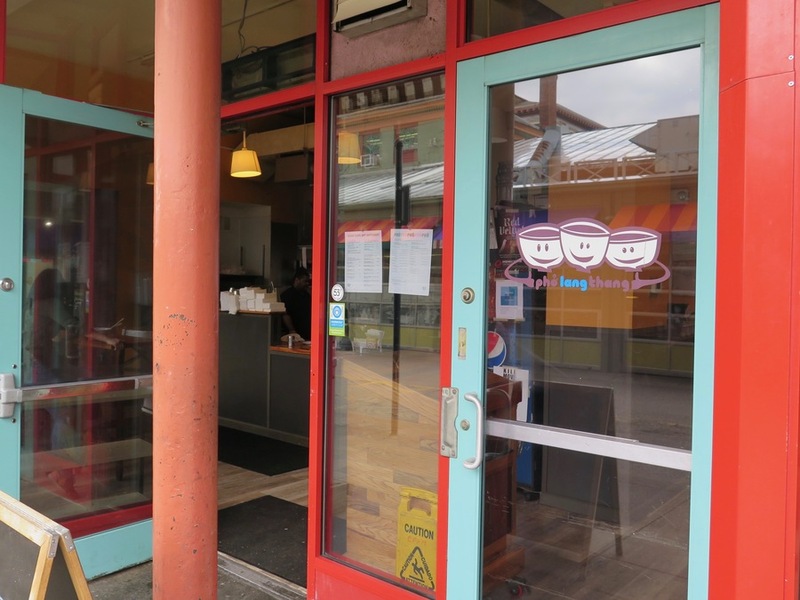 While Pho Lang Thang’s former inspector tended to visit before the lunch rush, the current inspector usually visits right when the Findlay Market restaurant is most busy. That comes with the territory for any restaurant that is rushing to serve a Downtown lunch crowd, he said. In that respect, Nguyen’s brick-and-mortar restaurant has a lot in common with Akers’ Pretzelfuls food truck when it gets busy. Food businesses of any kind have some simple rules to keep in mind, he said. • When Kesterman eats at a food truck, he also looks to make sure there isn’t any milk or cheese left on the counter and that employees are representing themselves cleanly. If you see someone wearing an apron that is covered in food, he said, that probably means that person is wiping their hands on their apron instead of washing them properly. WCPO obtained data on food-safety violations from three public agencies that maintain digital records for local health jurisdictions in in eight local counties and three cities. The sources are the city of Cincinnati’s “open data” portal, the Northern Kentucky Independent Health District and the Ohio Department of Health, which contracts with a company called HealthSpace USA to maintain digital records all over Ohio. The local counties in WCPO’s database are Hamilton, Warren, Clermont and Highland in Ohio and Boone, Kenton, Campbell and Grant in Kentucky. The cities are Cincinnati, Springdale and Middletown. Dan Monk covers business news for WCPO. To read more stories by Dan, go to www.wcpo.com/monk . To reach him, email daniel.monk@wcpo.com. Follow him on Twitter @DanMonk9.